Edouard Jean of Cap Haitien and Milot follows in the north Haiti tradition of history paintings. He reads history books, and his re-creations are drawn from the books and from his precise knowledge of the places where the events took place. 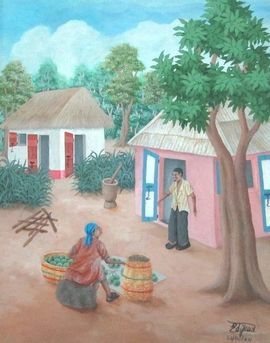 He also paints scenes of urban life in Cap Haitien and of rural life in Milot and the small villages in the nearby hills. Some of his works are details of the tropical landscape in which these villages are sited. The works may seem romantic, but are based upon his careful observation of nature. His works have been shown in Haiti and the United States and are in private collections in Haiti, Canada, the United States, France and Germany.